My goodness, I have gotten so involved in my life that I have forgotten to post anything lately. In my last post I showed you a couple of blocks that I had made in a wonky 9 patch style. 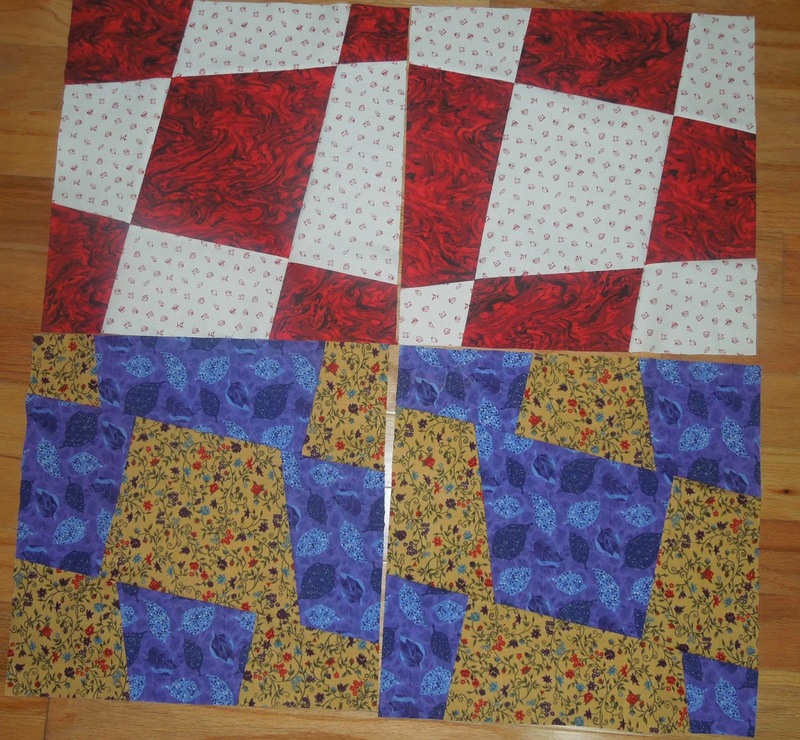 Since they are stack and cut, you use two fabrics a little larger than the blocks and get two blocks. I did two more of those before I put it aside to weave a scarf for a commission. The top two in red and white look great. But what happened to the bottom pair???? I know! Sigh. After cutting and sewing the first seam, I didn't stack them back the same way. Obviously they were twisted rather than being in the same orientation. I am calling those two ultra-wonky 9 patches. Ha ha. The will go right on into the quilt and it will be fine. If I were doing the entire quilt in two colors this would ruin the pattern, but since it is a more scrappy quilt - it will be just fine. 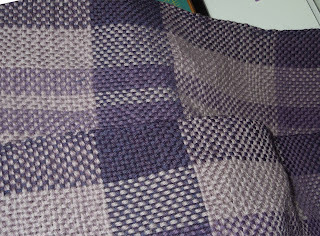 The scarf is still attached to the loom at one end. This is the end where the warp is tied onto the take-up rod. Those big bow knots hold the tension evenly. It doesn't remain in the final scarf. This lovely yarn is Peruvian Highland Wool. The wool comes from sheep that are a cross between Merino (with a soft fine wool) and Corriedale (with a strong long fibered wool.) It is a great yarn to work with. The pattern I used was of my own design. 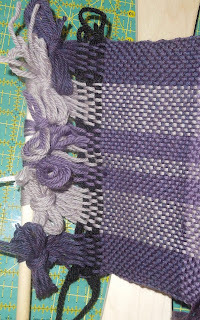 One of the "tricks" with weaving matching stripes is to measure your weaving. I kept a tape measure right with me as I was weaving. I knew how long I planned for the warp so I sat down and planned the pattern. 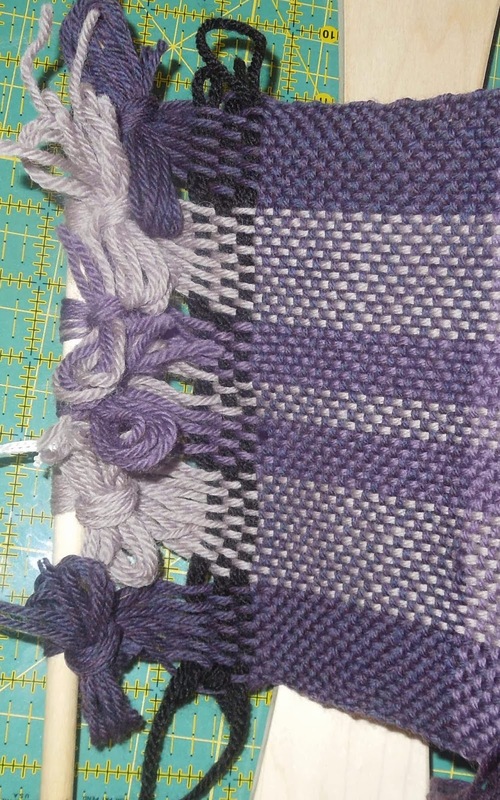 I didn't want too many color changes in the weft. But I did want the scarf to be interesting to look at. All the measuring paid off! The sections match. Here are some pictures to show it. 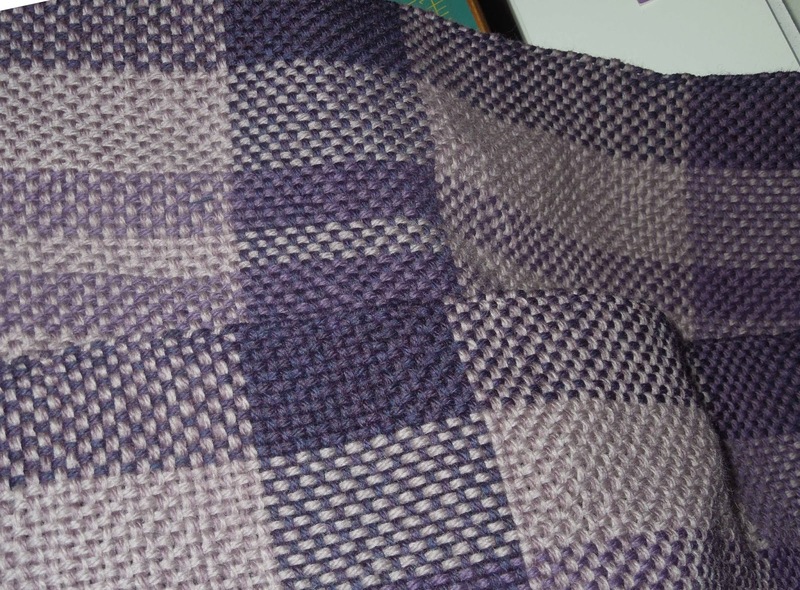 When you weave a dark and light yarn together, it produces a lovely tweed effect. You can see that really well where the darkest and lightest threads cross. 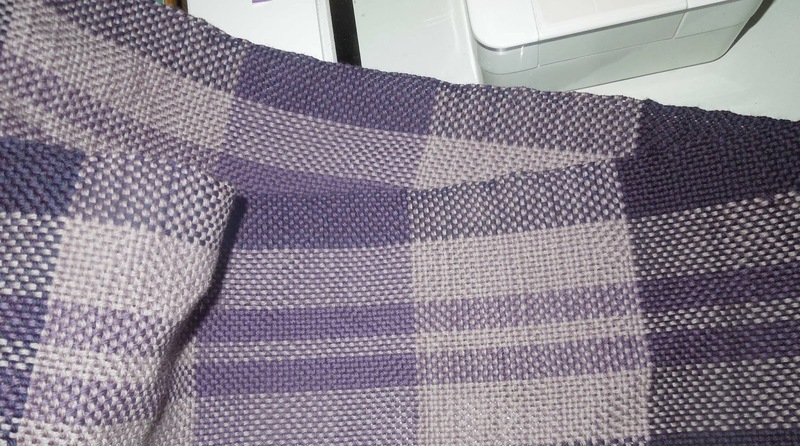 And when the warp and weft match in color the somewhat expected result is a nice solid color. That dark purple in the lower picture shoew this well. It is rare that I don't have some project going. I am even planning to take the small loom with me to the beach when we go to visit the Nana. I think one time I need to pay you to make me a scarf! I got a kick out of the name for your second two blocks...Ultra wonky! Love the way the scarf is going! Gene it looks like you've been weaving for years! I love the ultra wonky blocks. 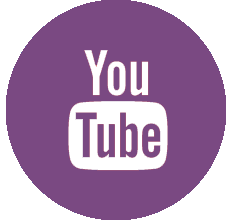 Do it a couple more times and it is no longer a mistake. I love your scarf! It is beautiful. It is hard to believe you haven't done this for years. Great job, my friend. lovely blocks and scarf. you are just a working machine whipping these out! 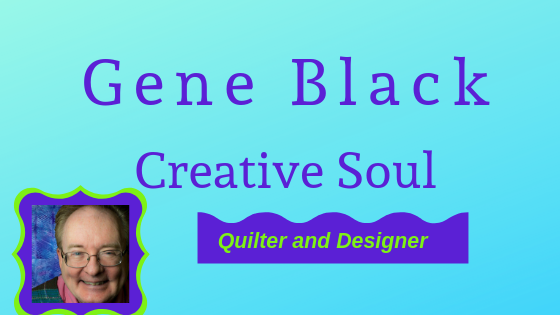 Your weaving is beautiful, Gene. The nice thing about scrappy quilts is that mistakes are usually end up being happy innovations.